We have been inspired by books lately. In the last post, our inspiration was an adult-level book about katydids. Today it is the children’s picture book Little Black Ant on Park Street by Janet Halfmann and Illustrated by Kathleen Rietz. The book is the next installment in the excellent Smithsonian’s Backyard series. I reviewed the book at my Wrapped in Foil blog and putting up related hands on activities for children on my Growing With Science blog, but here I’d like to take a look at the biology of the species. 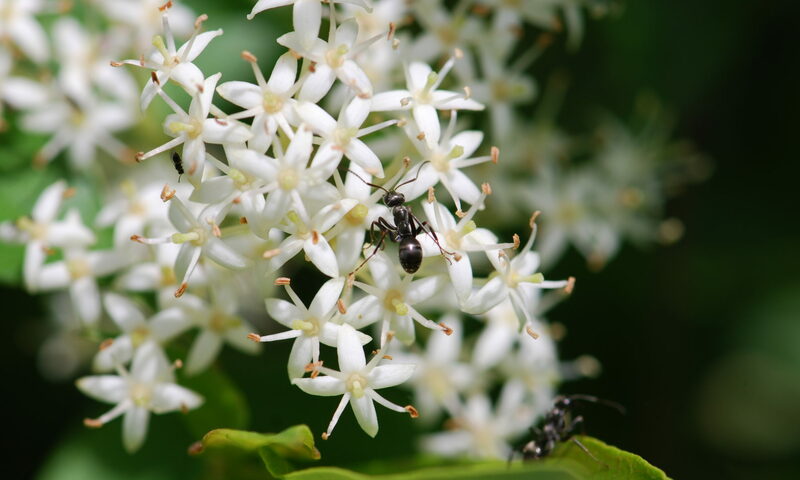 The little black ant, Monomorium minimum, is a relatively tiny species, native to North America. 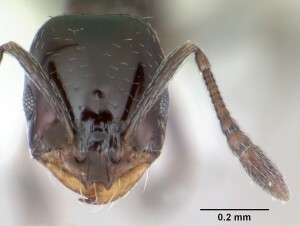 The workers are black, uniform in size and only about 1/16th of an inch long (1.5 mm). The petiole has two segments. 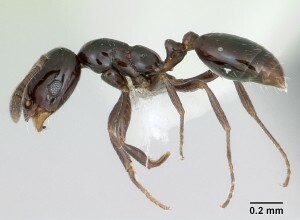 Monomorium minimum belongs to the tribe Solenopsdini. The workers have antennae with a three-segmented club. Their fire ant relatives have a two-segmented club. Unlike the stereotypical ant colonies with only one queen, colonies of little black ants often contain multiple queens. Monomorium minimum workers feed on honeydew, and scavenge dead insects and other arthropods, usually during the warmest part of the day. When foragers find a suitable item, they recruit nest mates by releasing a pheromone. Once recruited, groups of workers cut up larger items or cart away smaller ones. Here’s a short video of gaster flagging in another species. For a little ant, they pack a big punch. Monomorium minimum colonies can invade imported fire ant, Solenopsis invicta, colonies and take over. Given that these little ants are so interesting and relatively widespread and common, I’m surprised how little information I was able to find on them. Perhaps this new children’s book will spark some scientific inquiry by the next generation of myrmecologists. Thanks so much for this great information on the little black ant. You’re right that it was difficult to find accurate information on this species when I was writig the book. This post is so useful! Supposedly these little guys occur here in AZ, so I’m going to keep an eye out. Thank you for your inspiring book. I’m also glad you published this. In the past few weeks of doing yard work, I’ve come across three different colonies. In a year or two I’m planning on finding some queens during the mating season and starting a home grown nest. Oh, those ants are sooo little. Good luck with your project. Not technically feed on, but some ants will chew on plastics.